is designed to specifically give a superfine texture to your dog’s coat, along with the proper amount of body. We recommend using formula 1 on all fine texture coats. Formula 3 is designed to give a thick, full-bodied texture to your dog’s coat. 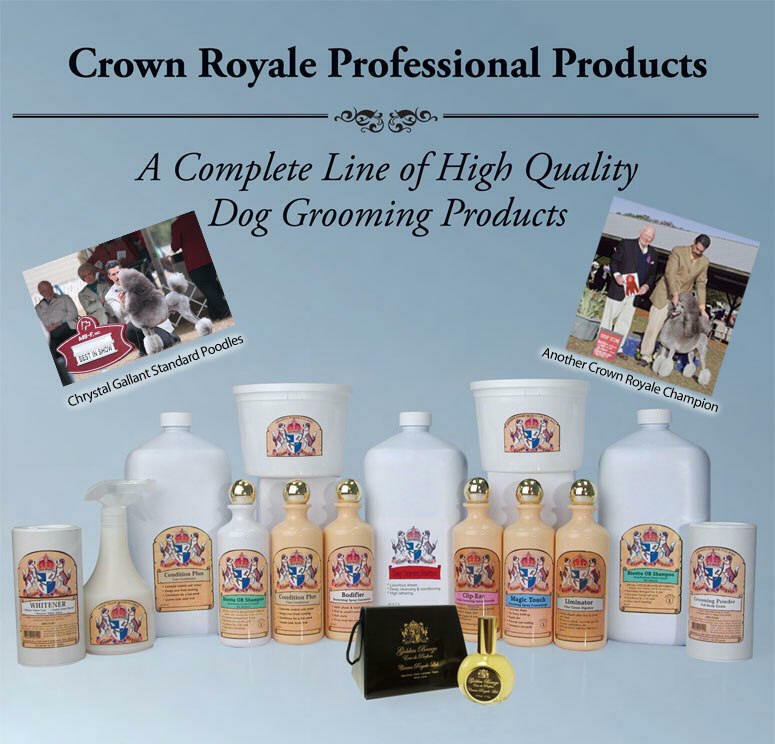 If you feel you need extra texture on your dog’s furnishings, use our Crown Royale Bodifier. All three Biovite formulae are amazingly high lathering and fortified with Biotin/Panthenol vitamin and Allantoin. Biovite deep cleanses and conditions both coat and skin and revitalizes damaged hair by stimulating the skin and accelerating the metabolism of inert cells to promote hair growth and retard shedding. All three formulae give the desired texture to the coat immediately and is lasting. You do not have to wait days for the texture to return. A texturing spray concentrate that adds sheen and bounce to coat, is rich in conditioners, and firms coats texture. Bodifier strengthens coats and helps prevent breakage while keeping furnishings in place and static-free. Condition Plus gives coat spectacular body, bounce and static-free manageability in one application. A substantive conditioner is used that bonds to the hair shaft allowing for fantastic control and sheen and keeps the coat form matting. Will condition from shampoo to shampoo. Condition Plus is recommended for all fine and medium texture coats as an after shampoo conditioning rinse. When used as a conditioner for dog’s furnishings, Condition Plus may also be used on terrier texture leg furnishings to prevent breakage and promote growth. When you wash Condition Plus out of terrier texture furnishings, use Biovite Shampoo Formula 3 to restore texture to hair. Spray Concentrate The ultimate finishing spray for the show dog. Magic Touch gives luxurious sheen, has no heavy build-up, repels dirt, and prevents coat matting. It is formulated with conditioners, optical brighteners and silicones. Our special emulsifier allows Magic Touch to be shampooed out easily. Formula 1 is specifically balanced to enhanced fine texture coats. It will give your dog’s coat a natural-feeling silky texture along with total control. Formula 2 is specifically balanced to enhance medium texture coats. It will give your dog a natural sheen, stain repellency and complete control without any change in coat texture. Formula 3 is specifically balanced for full bodied texture coats and gives your dog’s coat a natural sheen and enhances its full body texture. Special Note For Poodles : When you wish to remove hair spray from coat, spray with Magic Touch and it will enable you to brush out coat without breaking any hair. Grooming Powder is designed to clean and intensify coat color without totally drying out hair. It is a blend of cleaning powders of proper texture to clean and add texture, yet gentle enough not to make hair brittle. Crown Royale Ultimate Detangling Spray is a unique easy to use spray that removes tangles from wet or dry coat.